Palladium. For the last three years, nobody cared a lick as this precious metal nearly quadrupled in price. Over the last month however, I’ve seen more mentions as its price trend accelerated than I did for the entire three-year trend beforehand. 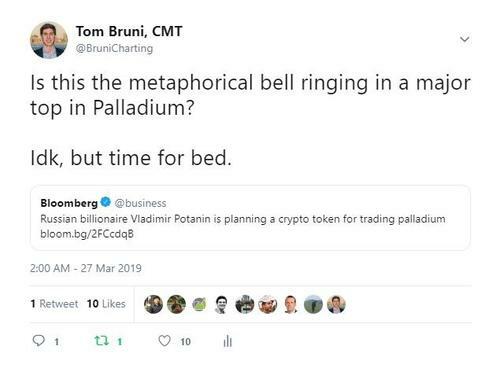 The other night my colleague Tom Bruni noticed a Bloomberg headline about a crypto token backed by palladium and he facetiously tweeted that the metaphorical bell at the top had been rung. My point here was that sentiment was getting pretty loud at what I see as the exact wrong time. Ironically, the next morning PALL was trading down more than 6%. A decent read on the market? Maybe. Lucky timing? Most definitely. That brings me to the chart I want to focus on today. A daily chart of palladium, which confirmed a bearish momentum divergence and a failed breakout above its early March highs. With prices still well off their 200-day moving average, there’s plenty of room for downside mean reversion. What I want to focus on here is not that we want to be short palladium right now, but instead that this is a great example of waiting for price confirmation before acting on divergences. If we look at the trend since last October when the first momentum divergence formed, it was still a strong uptrend and prices rallied 45% in the face of that divergence. Divergences need price confirmation before we can act on them. Price pays, everything else is ONLY a supplement. Now that the Palladium gravy train has stalled, we’re shifting my attention to a precious metals pairs trade that we’ve been stalking for months. That trade is long platinum and short palladium, which is working to confirm a failed breakdown below its 2001 lows and a bullish momentum divergence. While we still need to wait for a weekly close above 0.559, it looks like we may get it soon. How that plays out is anyone’s guess, but it’s not our problem anymore. We’re moving on, but not for good. We’ll be back if and/or when conditions improve again and offer a skewed reward versus risk setup that’s in our favor.